It's that time again! For us, getting these photos is like opening up a gift at the holidays. We just never know what we're going to get. We are coming to the end of the original few challengers and will be picking the next group soon! All previous challenges can be see here or you can click the top right corner of our sidebar anytime you want to see the posts. This month we welcome Vistra. She's a mom to four girls, wife to husband Ron, and a new business owner of a cute fabric store, "Vistra's Crafty Boutique." Vistra lives in Clinton, MS and she loves her community. She tells us "I picked up a sewing needle when I was four and the trail of thread has filled me every since." Her store looks lovely! If you live nearby, check it out. If not, she has a lovely website. 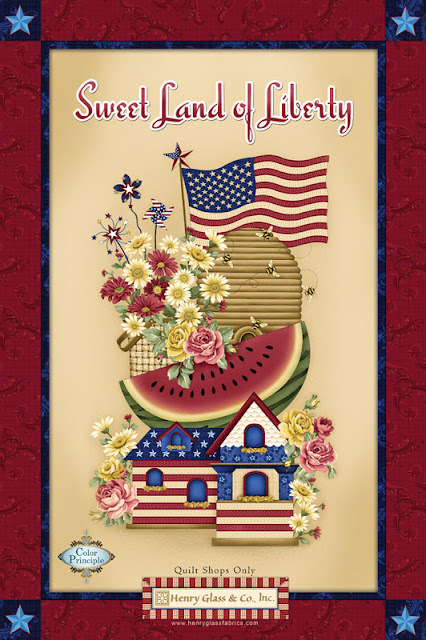 Vistra made three projects from our fabric, Sweet Land Of Liberty. You can see the entire line when you click on the link. 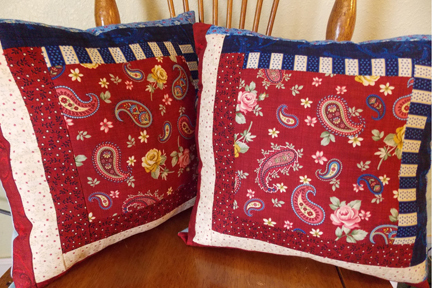 First, she made these easy pillows. So quick and so fast. You can make these for summertime decor. Vistra cleverly used the panel to make these hot pads. Simple and quick hostess gifts for summer parties. We thought that we'd save the best for last. 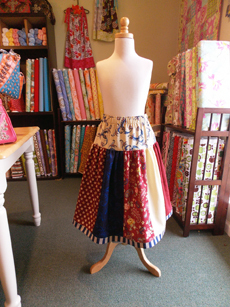 How adorable is this skirt? Vistra, you did a fabulous job! Thank you so much for participating in our challenge. Make sure that you visit Booth 1816! 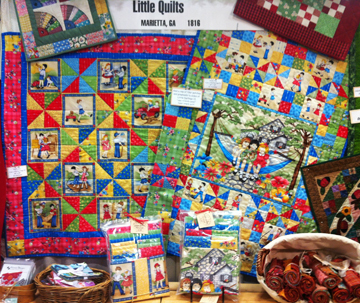 Little Quilts are ready for you in Paducah. Have fun and enjoy the show. 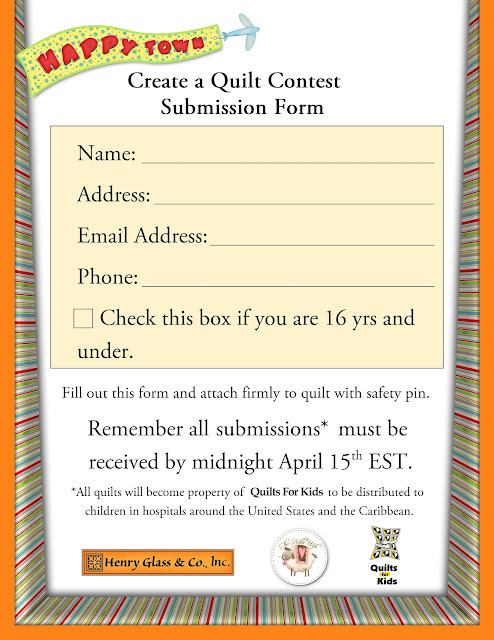 Who's Going To The 2013 QuiltWeek in Paducah? 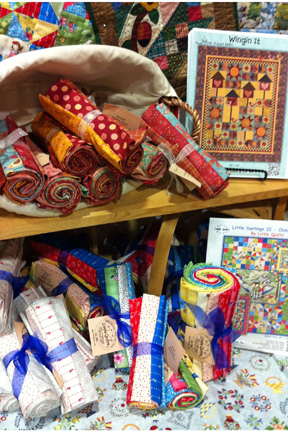 Why Little Quilts, of course! Jackie wasn't quite sure where to start. Eventually the ladies got busy and figured it all out. We are kidding. The booth started coming together quite nicely, don't you think? We love the little details. Here is a wonderful finishing touch. 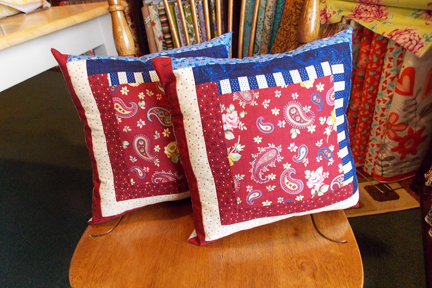 Buggy Barn's Winging' It looks great with Little Quilts' Little Darlings II. 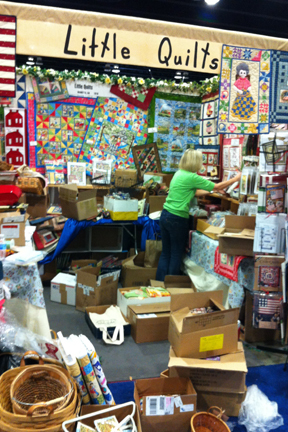 Are you going to the 2013 AQS QuiltWeek from April 24-27, 2013? 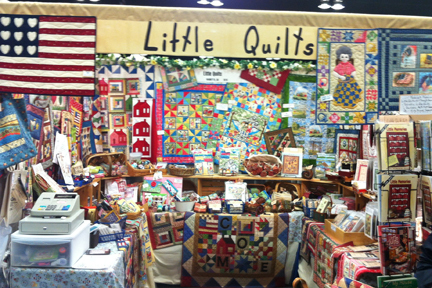 Have fun and check out Little Quilts' booth! It's A Bright And Happy Monday! We love receiving photos from you and we love it even more when our fans are so very adorable! 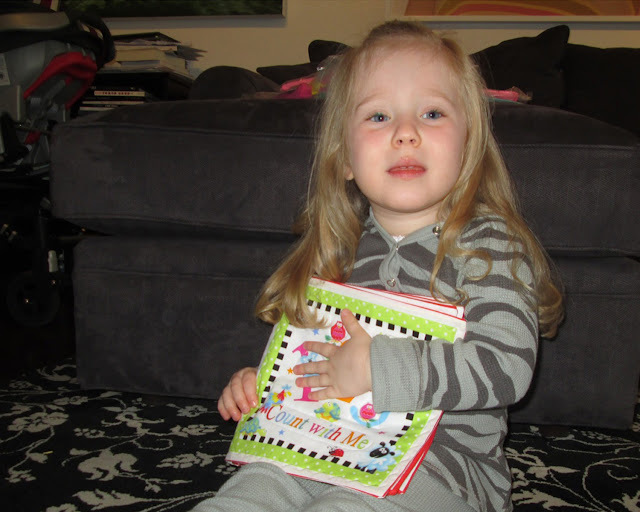 This little fan loves the fabric book which was made from Delphine Cubitt's Alphabet Soup line. Look at that smile! We wonder if the owls were the ones that made her laugh. It could have been the lady bugs. We'll have to ask her. 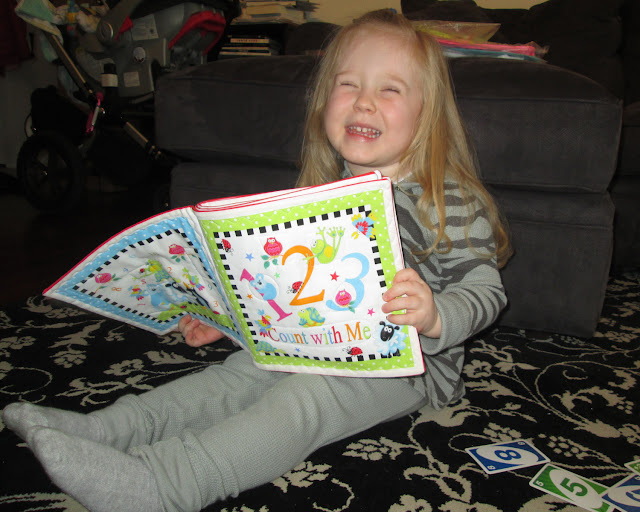 pdq* Club - April Edition And Giveaway Too! 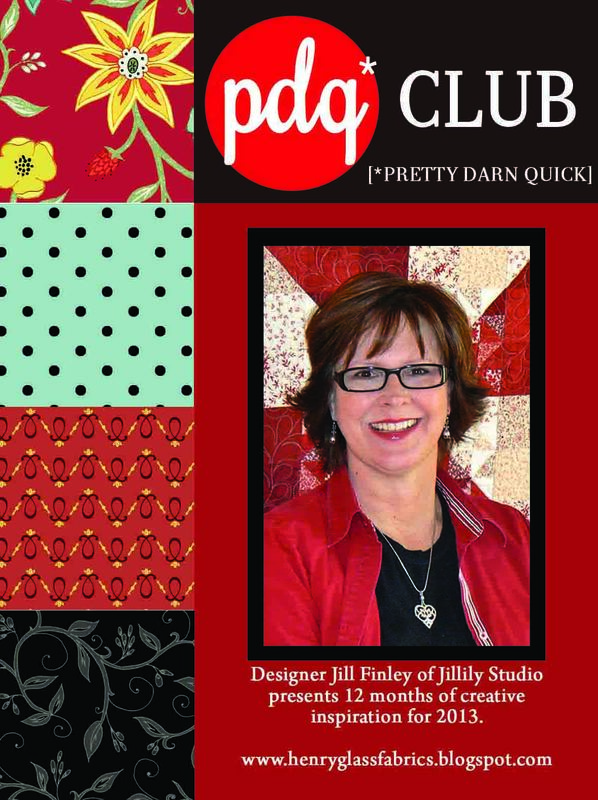 Jill Finley of Jillily Studios has designed very cute project for her pdq* Club [Pretty Darn Quick]! Have you been following along? You can find the link to the right. All of the club posts are listed under pdq Club. You can download the directions here. Let us know how much you love this pdq* Club! We can plan for more fun things like this! 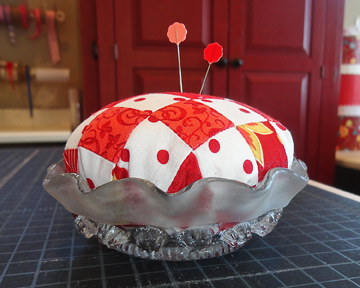 This pincushions are adorable. The red and white color combinations add a whimsical touch, don't you think? We would love to see what combinations you come up with. 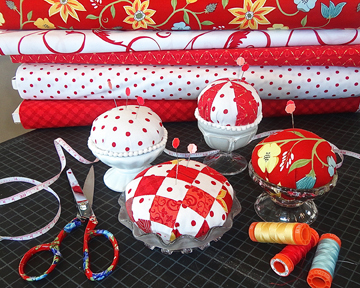 Jill used the lovely red and white fabrics from her Beyond The Gate line. Meanwhile, pop over to Jill's blog. 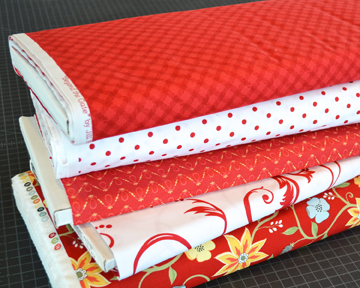 She's posted a great preview of her next fabric line, Patio Poppies. You won't be disappointed. We have a winner from last month. Congratulations! Jill has inspired me to try applique. Her videos and designs are great! Please contact us here. 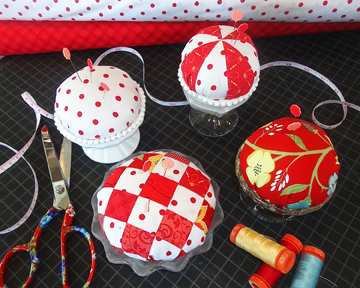 Leave Jill some love for her pincushions in the comments up until midnight May 19, 2013 and we will select our next winner of a random bundle of fabric! Hello! We got a message from Little Quilts designer Mary Ellen Von Holt yesterday that we want to share with you. New books come in almost daily to Mary Ellen Von Holt’s shop Little Quilts near historic Marietta Georgia. 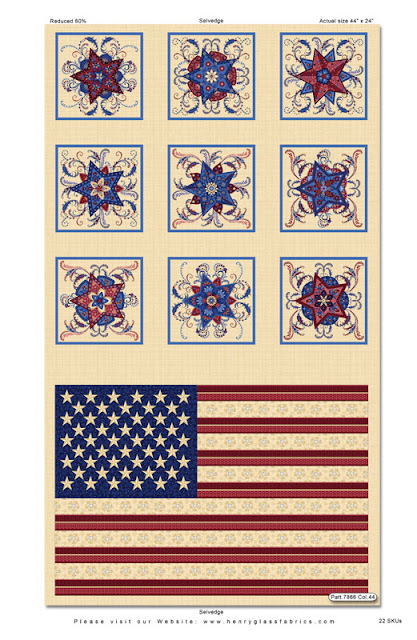 One of the new ones from That Patchwork Place/Martingale is “Large-Block Quilts”, by Victoria Eapen. Victoria by the way is a dentist. Mary Ellen was reading the section “About The Author” and read that Victoria’s introduction to quilt making was in 1997 while in dental school, she purchased her first quilt book – “Little Quilts All Through the House”, written in 1993, by Mary Ellen, Alice and Sylvia of Little Quilts. 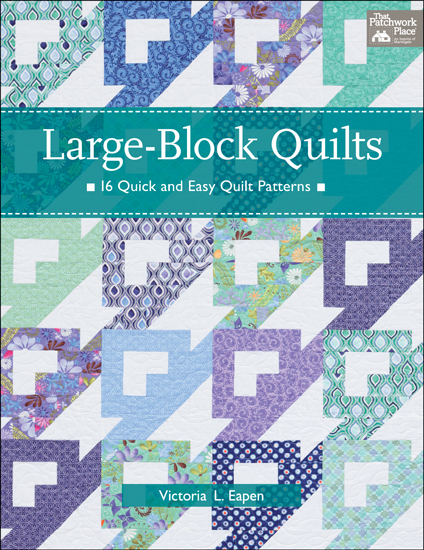 Mary Ellen often hears from customer, and other designers that LQATTH was their inspiration and first book on quilt making. 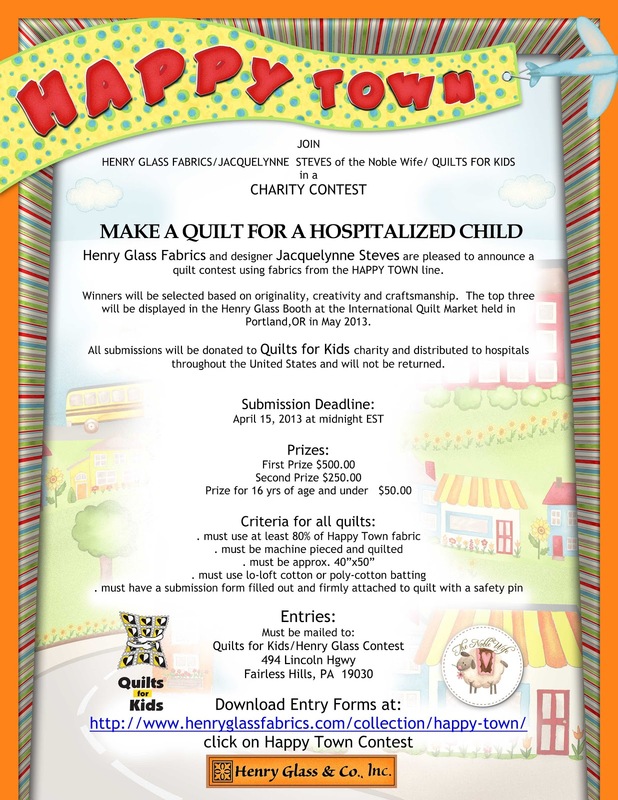 You can purchase the book on their website – www.littlequilts.com, autographed and free shipping! 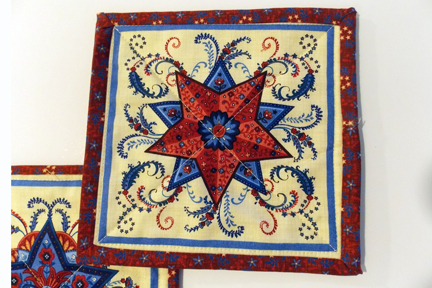 Many of the fabrics from Henry Glass fabrics, including “Pheasant Run”, lend themselves perfectly to the patterns in the “Large-Block Quilts book”. Thank you Mary Ellen! That is wonderful. 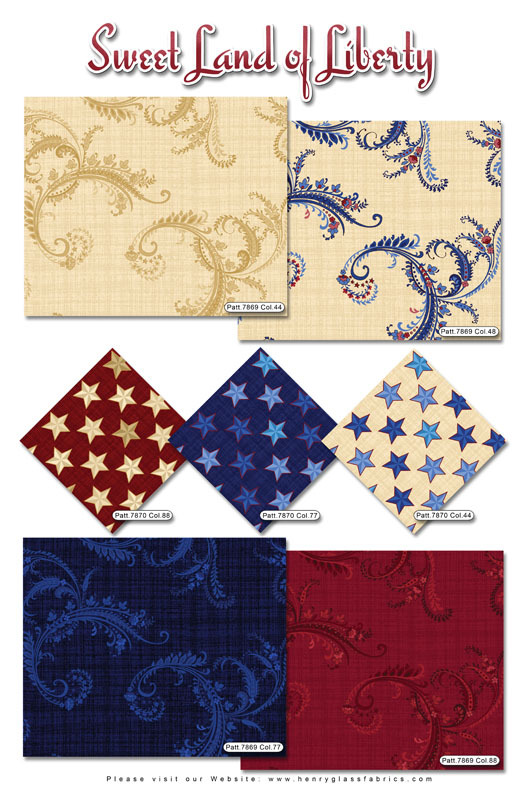 You can check out all of the fabrics by Little Quilts here. We are still waiting for a few of you to contact us to claim the prizes from our little blog party a short while back. The list of winners are here. Please send your contact information here if you have not done so already. If you don't reply by this Friday, April 19th midnight, you will lose your prize and we will choose another name. 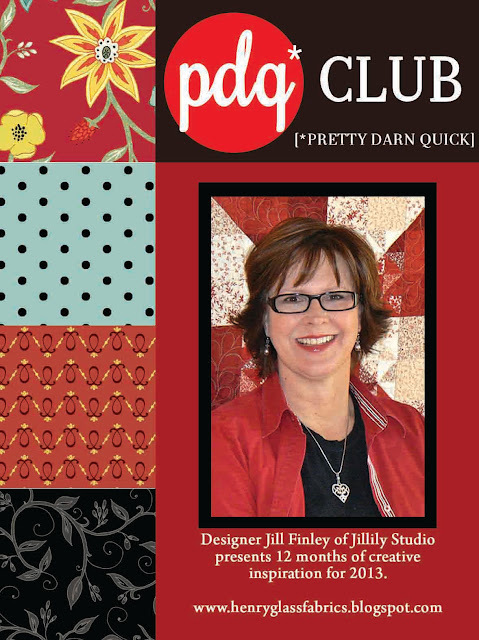 We love to see Jill Finley's designs in print. Her latest is in the McCall's Quilting Magazine May/June issue. Run out and get a copy! 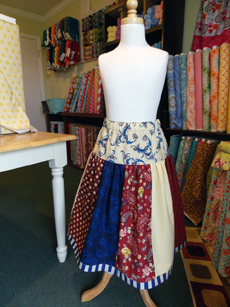 She used her lovely Beyond The Gate fabrics and we think that it is fabulous. If you want a kit for it, you can buy it here. 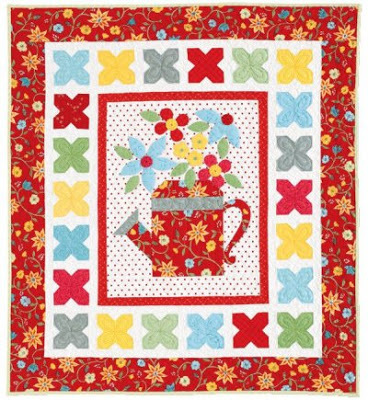 What a great quilt to celebrate spring! 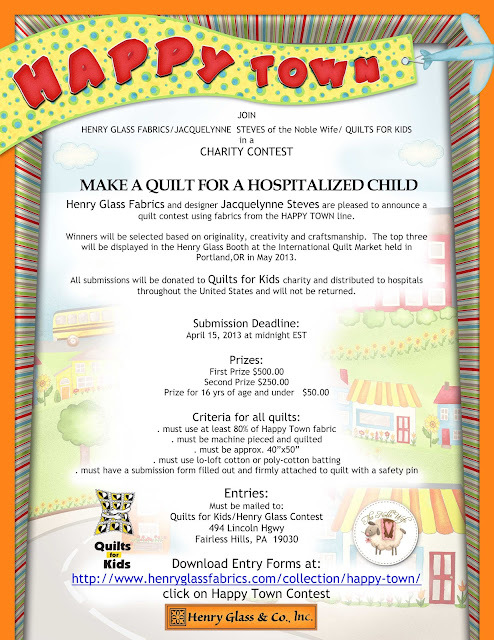 This is a friendly reminder that the Happy Town contest deadline is coming up. 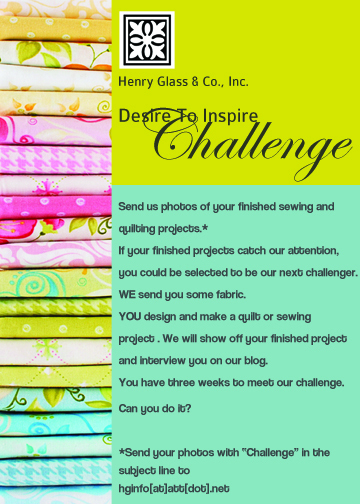 Are you happyily designing and sewing up something great for us? We hope that you had a great holiday weekend. 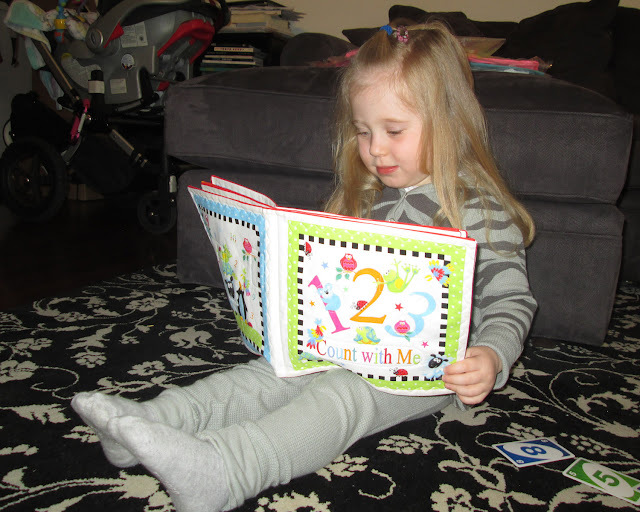 We had fun reading through all of the comments and we can enthusiastically say that we have the best readers! Thank you! We have the answers and winners for you. If you are a winner, please send your details here and post the day that you won in the subject line. 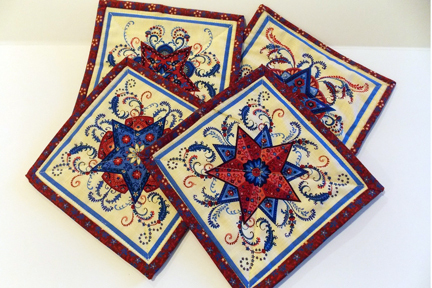 I love tutorials on quilting blogs & the new patterns & fabrics that come out. 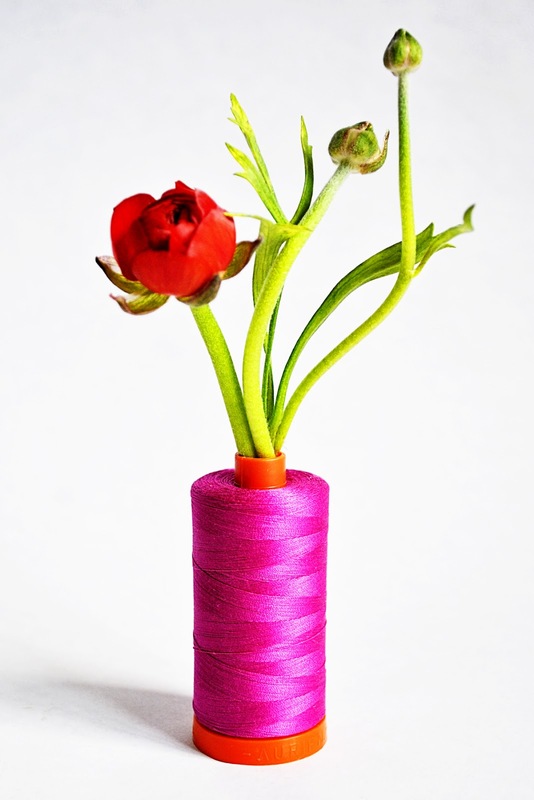 Sew inspiring. 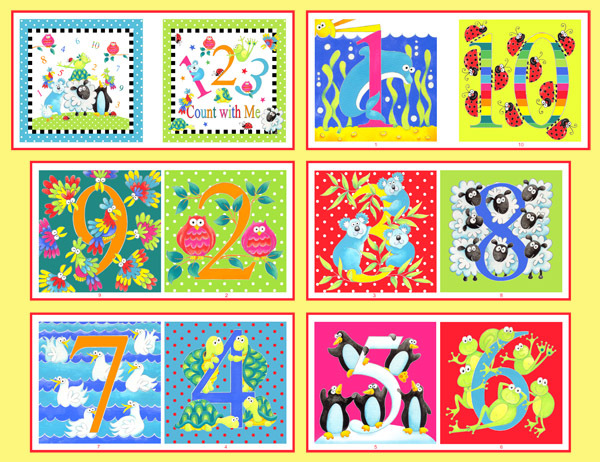 I do follow quilters, fabric manufacturers & quilt shops on facebook for the same reason. 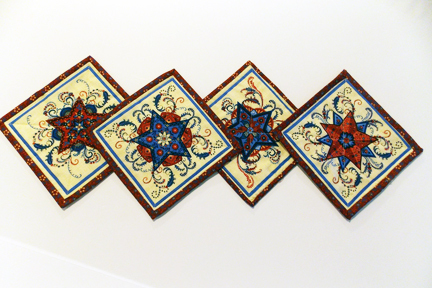 3 I think the churn dash is a classic but I'm hooked on hexies right now. Thanks! We look forward to some more fun. Stay tuned. 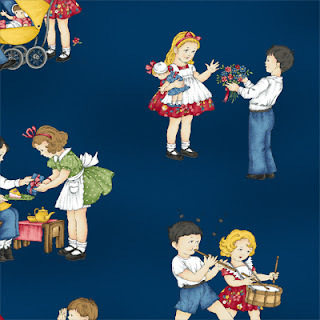 We are planning to play while the designers are away at Quilt Market next month. Shhh. We'll fill you in here and on Facebook soon. Meanwhile, check out our website for the latest releases. Just click on the pictures on our home page to see the entire line. Look for these lines at your local quilt shop in the future!